If you’re looking for help looking for the perfect stain or paint color for your next project, stop into Accent Paint Store. We have the tools to assist you. Put the PPG Color Work Station to the test on your project. Drag and drop colors, watch videos, paint rooms and more. Like what you see? Email your saved colors and projects to yourself and they’ll be waiting for you when you get home. What happens when you simplify browsing beautiful colors, create a no-fail paint matching system and bring in-store color displays into the 21st century? Come see for yourself, stop into Accent Paint Store at 6800 US Highway 12 in Eau Claire, Wisconsin. We are right next door to the Green Thumb Nursery. 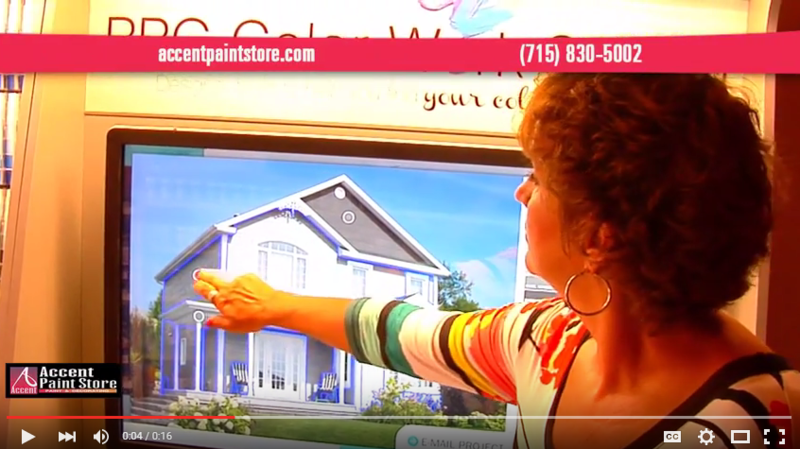 You can only find the PPG Color Work Station, paint color kiosk, at Accent Paint Store.